Author Randy Skretvedt, in his superb study Laurel and Hardy: The Magic Behind the Movies, uncovered another film in which he originally was to appear, but his final scenes were deleted. This film was Way Out West, and Tiny was playing the sheriff that ran the boys out of town. As evidenced by a still printed in the book, at least one scene in Mickey Finn’s room was filmed with Tiny Sandford. However, when it was decided to film additional footage of the boys travelling via stagecoach and annoying Vivien Oakland, followed by a verbal reprimand from her husband the sheriff, Tiny Sandford – for some unknown reason – was not available to appear in this scene. The only thing to do was to hire another, similar-looking actor to assume this role. The choice was to use Stanley Fields, who ended up playing the role brilliantly, becoming immortalized to Laurel and Hardy buffs everywhere. 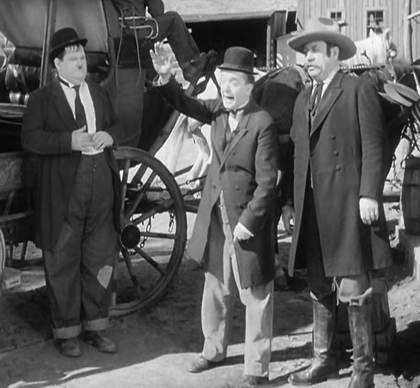 In order to achieve continuity, other scenes that originally included Tiny Sandford were re-filmed, including the scene in Finn’s room where the sheriff runs Stan and Ollie out of town and an brief early scene in which Finn and the sheriff discuss Lola. 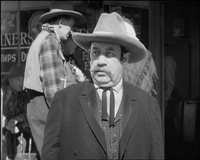 This would have diminished Tiny Sandfords final score to 23 films with Stan and Babe, but thanks to some perfectly fine long shots already filmed with Tiny portraying the sheriff that no one would ever notice on screen, it can now be revealed that Tiny actually appeared in 24 films with the boys. The scene above is all the evidence that we need that shots of Tiny Sandford did remain in the film Way Out West. (Note the difference in the attire of Fields and Sandford, seen below). This particular shot is the most obvious, but there is one additional shot at the very beginning of the film outside of Mickey Finn’s Palace. 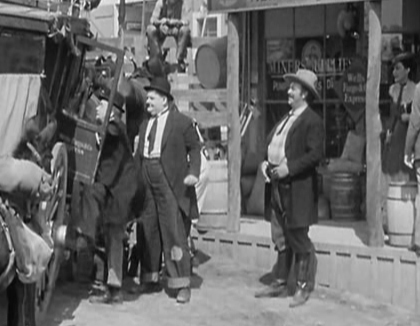 Here the sheriff can be seen approaching the entrance to the saloon and shaking hands with a gentleman outside the door. « Viola Richard: Where Did She Went? Very nice to have this explained once and for all: Sandford wasn’t available for the additional scenes so others were re-shot as well. I must have seen WOW dozens of times but never spotted him in those long and medium shots. Congratulations: you guys are sharp! I never noticed that, will have to keep my eyes peeled for him! Tiny Sandford is/was my grandfather. I was told by my dad, Robert Sandford, (Tiny’s son born Feb. 27, 1921) that Tiny didn’t have any teeth, so any film role that had a speaking part could not be played by him. I believe this is why he was not “available” for re-shots.